Available in the over than 150 markets around the globe, the Mitsubishi L200 (or Mitsubishi Triton in some markets) is the brand’s second best-selling model and in order to keep the good pace with increasing number of the refreshed or all-new, mid-size trucks, the brand has recently updated the model with the extensive array of modifications on all fronts. The mid-updated model debuted at the 2018 Bangkok Auto Show in the country where it is built but will arrive in the UK in 2019 possibly as the 2020 Mitsubishi L200. The brand focused on the criticized exterior appearance of the model and bought it in line with its latest design language. The model also introduces the new wheel options and comes with the revised interior design and switchgear. The brand boosted also the safety ratings of the model with the enhanced array of the crash avoidance technologies. The mechanics benefit from the new six-speed automatic transmission and upgraded braking components. The engine options remain the same. Mitsubishi launched the current generation L200 for the 2015 model year and highly commented and criticized exterior styling has finally come under the revision. 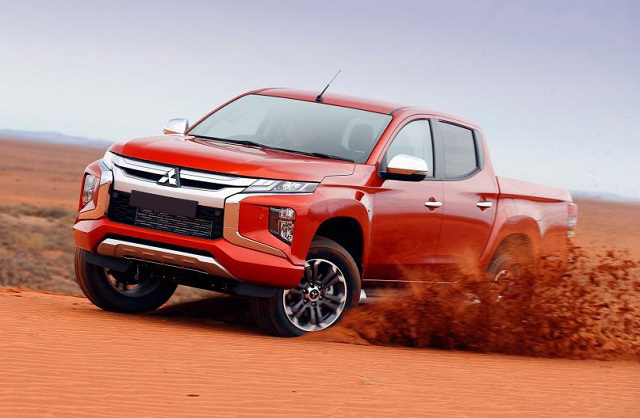 Obviously, the truck buyers are more inclined toward a more rugged appearance of the truck and somewhat softer exterior of the Mitsubishi L200 polarized the public. To put the things in the right place, Mitsubishi made radical changes on L200’s appearance. 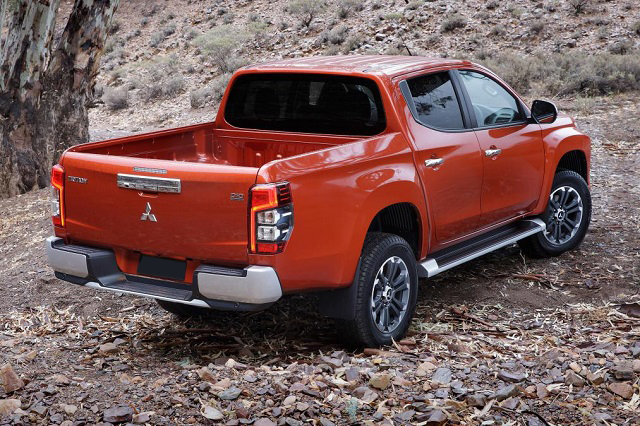 The 2020 Mitsubishi L200 has the redefined front-end styling and the tailgate area but there are more appearance changes as well. The radically changed front fascia adopts the Dynamic Shield design language to get inline with the brand’s newest SUVs and models. The new styling is familiar from the Pajero Sport, ASX, and other versions and includes the new grille and bumper design. The model has dual-bar radiator grille and slimmer headlights with the bi-LED units in the top versions. The headlights are also positioned higher and the hood line is also 100 mm upper. For a more masculine appearance, the model has also the new, squared-off fenders and sculpted cheekbones. The appearance of the model benefits also from the new, two-tone wheel options in 17- and 18-inch options. The new LED taillights round up the mid-update changes. The changes continue inside the cabin and with the introduction of the new tech features. The new L200 comes with the reworked center console combined with the new switchgear and air vents. The soft materials are used on the center console sides, door inserts, armrests, and handbrake. The model adds also a new smartphone tray equipped with USBs and the rear passengers get also the tray with USB ports behind the center armrest. Mitsubishi improved also the safety side of the truck and expanded the availability of the advanced systems. The truck will equip forward collision warning with automatic emergency braking and pedestrian detection. An array of the crash avoidance technologies will also include blind spot warning, rear cross-traffic alert, automatic high beams, a 360-degree view, parking sensors, and ultrasonic misacceleration mitigation system. The 2020 Mitsubishi L200 will return with the recently introduced and well-proven 2.4-liter MIVEC turbodiesel mill. The variable geometry turbocharger diesel engine provides strong low-end torque punch and keeps the emissions under the check. The power should remain at 179 hp available at 3500 rpm and peak torque of 430 Nm from 2500 rpm. The model will, however, arrive with the new six-speed automatic transmission which is the upgrade of the so far used 5-speed unit. The new transmission system should provide smoother gear shifts and more responsive acceleration. The truck will again use two four-wheel drive systems including the Easy Select system and more advanced Super Select II system. The latter system manages the torque split between the axles depending on the drive conditions. The updated Mitsubishi L200 will also rely on the improved braking system with the larger discs and calipers. The ride quality should also show the signs of the improvement thanks to the larger rear dumpers. The 2020 Mitsubishi L200 will go on sale in the UK in 2019. The price will appear closer to the on-sale date but the upgraded design and tech features should move the current base price of £19,505 slightly upper.